Our lively, illustrated monthly magazine with articles, technical information, classified ads and details of social events. Over 50 groups nationwide offer support and technical advice, as well as organising social meetings and events at a local level. Each ‘A’ series model has its own Registrar within the club, giving advice on authenticity, restoration and agreed values. Our Registrar of Registers is authorised by DVLA to give vehicle valuations for insurance purposes. This service costs a 2CVGB member £25 for the first vehicle, and £50 for any subsequent ones within the following 12 month period. Normal charge for non-members is £50. Our spare parts organisation (‘SPOG’) has been established to source, and where necessary, manufacture parts unavailable elsewhere. We also have a large stock of hard-to-find second hand spares in our Ruskington storage unit, which are available to our members to purchase. We hold an Open Day at Ruskington once a year (usually at Easter), so you can come along and have a rummage. We'll keep you posted via the events calendar should an open day be organised. Our comprehensive 2CV owners' reference manual is compiled from years of our members' practical, real-world experience. 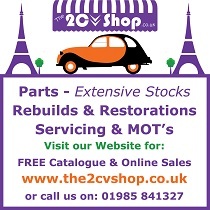 Contains histories of all the A-Series models, technical data - everything from paint colours to year of manufacture - technical features to guide you though the art of 2CV maintenance and a brief history of 2CVGB and its work. This invaluable guide is exclusively available to 2CVGB members for just £17 (UK) / £22 (EU) / £27 (non-EU) inc. p&p. We have a constantly expanding website with a ‘members only’ area including a technical forum and very popular chat room. 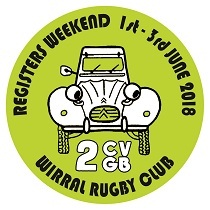 2CVGB hosts an annual National Rally and a Registers’ Open Day. Local groups organise weekend camps and evening social events. 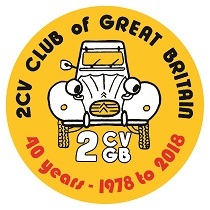 Further afield, 2CVGB members are always welcomed at overseas events like the International Meeting of 2CV Friends, held every two years in a different country. Selling a range of books, models, clothing, stickers and other A-Series related items. Access to an extensive collection of A-Series related literature, photos and other memorabilia. 2CVGB members also enjoy preferential rates on insurance and recovery services.